One of the great features in Microsoft Outlook is the ability to design custom forms. 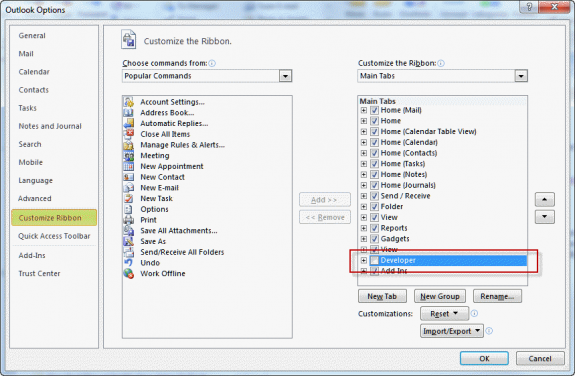 In Outlook 2007 you need to enable the Developer ribbon for Outlook items (mail, calendar, contact forms, etc) from the Office Icon, Editor options dialog. You can also open the Forms Designer as you would for all older versions: using Outlook's Tools, Forms menu. Once you have the Developer ribbon enabled, you can open a new Outlook item (of the type you want to design) then choose Developer ribbon, Design this form and the form opens in design mode. Any content already in the Outlook item will be carried over into the form. If you prefer, you choose Design a Form and browse for the form type you want to design. In Outlook 2007 and older, you can open forms from the Tools | Forms menu, choosing Design a Form when in the main Outlook window. 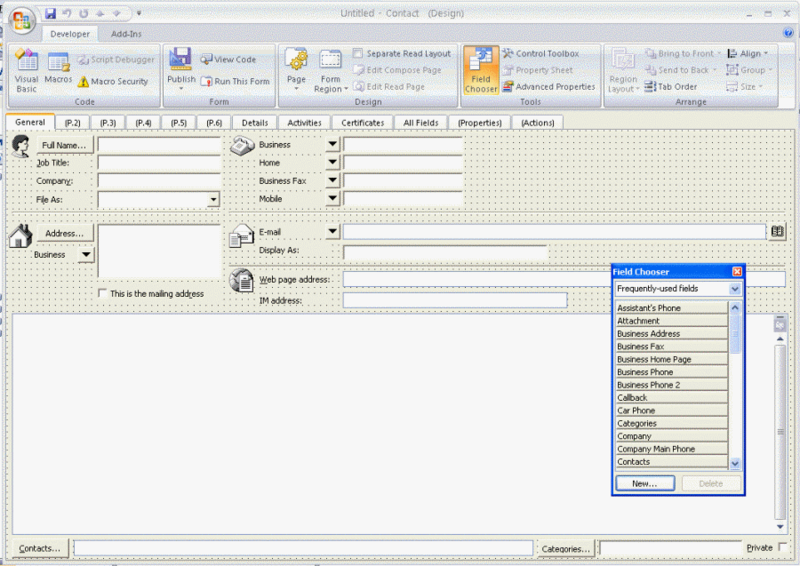 In Outlook 2003 and older, you can also use the Tools | Forms | Design this form command in an opened item. 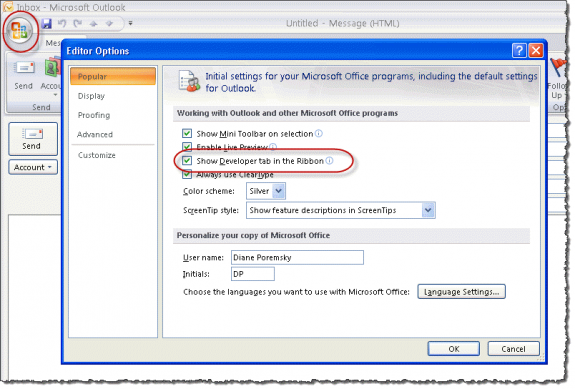 Outlook supports separate read and compose pages. Check the settings under the Page options and if you are using a separate read layout, you'll need to Edit the Read Page too. Save as a template or publish the from? When you are finished editing your form, Publish the form or save it in Windows file system as a template (*.oft). If the form contains VB Script, you'll definitely need to publish it. The screenshot below is of the Contacts form in design mode. Note that the Contact form looks like the old Outlook 2002 (and older) forms. As long as you don't edit the first page, it will retain the look of Microsoft Outlook 2003 Contact forms and up when published. Hello - thanks so much for your help! I have a custom form that we will be using to route recruiting requests for approval. My organization does not allow use of public folders in exchange so I am deploying it as an .oft and it works great. However, when 'replying' to the message the form contents are not included in the reply. When 'Forwarding' the message, the form contents are included just fine. Is there a way to have the custom form and form contents be included with 'Replies'? I am using Office 2016. I have a developer form that i send to all staff in order for them to add certain events to their calendar. After making changes to the key after the sept update, it now allows me to generate & send that form. My problem is that it only seems to add the events for some individuals not everyone. I.T. can't seem to figure out the issue. any suggestions? Thank you. Do they get any error messages? Was the key set on all computers? This is a long shot based on your description of usage, but you can try it. In Trust Center, Email security, is scripts in shared and public folders enabled? if not, enable the options and test. So I enabled the 2 options & tested & it still didn't work. I'm not getting any error messages, but I'm not getting the Operation Complete notification either. I.T. said the key didn't have to be set on all computers because I'm the only one generating & sending the form. if that has to be done, then we're looking at 80+ computers that would have to be updated. You will need to add it to the P.2... if you want a calendar control, you need to add it from the toolbox - right click on the tool box dialog for the option to add more controls to the toolbox. I'm having an issue with my custom template. When I publish it, it's hidden and then I can't locate it to use the template. Am I publishing it incorrectly? Thanks! it's hard to say, but it's also hard to do it wrong, so i don't think so. Do you select a location to publish it? What folder was open in Outlook when you published it? If you publish it in 'Outlook folder', which is usually the default when you click Publish, its in the current folder and should be on the New items > Custom forms menu when you are in that folder. if elsewhere, you need New items > More Items > Choose forms and will probably need to browse the different locations for it. Your forum has provided me so much information that it has allowed me to create an Outlook form myself. I am running into an issue and would like assistance. I created a message template to collect some information. I created the read page as well. I published the form and I am able to test it by sending an email to myself; however, when I send a message using the form to someone else, they are unable to see the information...really nothing and I don't understand why. In addition, I would like to know if there is a way where I can send the file of this form to someone else so they can use it to collect the same information. And one more question, is there a way that I can use the form to collect this information, send it to someone else but the information is delivered as simple text not the actual form? Any assistance you can provide would be very much appreciated. Thank you. If you are sending it to internet addresses (rather than co-workers on the same Exchange server), you need to include the form definition. They need to be using Outlook and the TNEF data needs to be intact (some antivirus scanners remove it). It's actually better to use a link to a webform (like survey monkey etc) - its a better experience and works with all clients. >> In addition, I would like to know if there is a way where I can send the file of this form to someone else so they can use it to collect the same information. Save it as an oft or as fdm (from the manage forms dialog) and send that to the others. >> And one more question, is there a way that I can use the form to collect this information, send it to someone else but the information is delivered as simple text not the actual form? The results in plain text format? That is possible. I am building a custom task form and am having trouble moving the objects around with my keyboard arrows. What am I doing wrong? I drag with the mouse :) You need to see the 'handles' then should be able to use the ctrl + arrow keys to move... or it's broken (i just tried it - arrow behaves like tab, ctrl+arrow does nothing). That was my experience too. Thank you. It's the June 13 2017 update. The security update from last week affected it (it was supposed to block scripts in templates, not published forms). I don't have an ETA on a fix - so for now, the fix is to uninstall it. Hi, My form runs when I am in developer run form but not when I am creating a new from by selecting it from ribbon. This is when you click the New [item] button? Did you set it as the default form for the folder?